North Korea's recent actions call into question the underlying assumption of Trump’s engagement with Kim Jong Un in the first place. President Donald Trump took a gamble meeting face-to-face with North Korean leader Kim Jong Un in Singapore in June. In justifying his decision, Trump argued that past attempts to dispatch experts to negotiate nuclear disarmament agreements with North Korea had failed, but that he would achieve better results by meeting directly with the decision-maker. Mounting evidence suggests that despite his self-professed dealmaking skills, Trump did not leave the historic summit with the decision he sought. 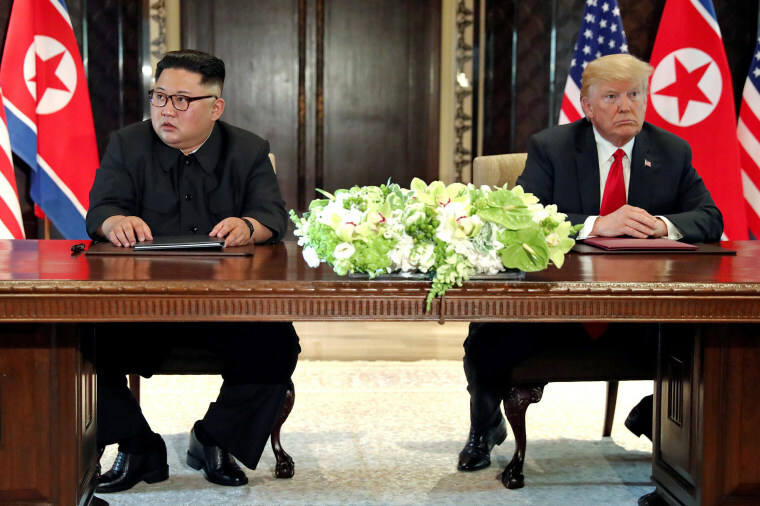 In Singapore, the two leaders agreed on a vague four-point declaration that was sequenced to prioritize improving bilateral relations first, and then “working toward the complete denuclearization of the Korean Peninsula.” The lack of specifics on denuclearization immediately raised red flags for veterans of past negotiations and experts on North Korea, who questioned whether Trump had squandered the leverage of a leader-level meeting and let Kim Jong Un off the hook by failing to nail down tangible benchmarks toward disarmament. Mounting evidence suggests that despite his self-professed dealmaking skills, Trump did not leave the historic summit with the decision he sought. Trump and Secretary of State Mike Pompeo swatted away such concerns, asserting that the two leaders had reached a clear understanding in their private exchange. They pointed to North Korea’s return of remains of American soldiers and its dismantlement of a satellite launch site as evidence of progress. Trump went even further, proclaiming that the North Korea nuclear problem had been “solved.” This likely reflected his faith in the importance of personal relationships and his belief that he and Kim had forged a personal bond in Singapore, and therefore the threat from North Korea had diminished. But the problem has not been solved and in fact the threat has only grown since Singapore. In the intervening weeks, North Korea reportedly has been upgrading nuclear and missile facilities, increasing production of fuel for nuclear bombs at secret sites, building new long-range missiles, and exploring ways to hide the extent of its nuclear weapons program from the United States. While these reported activities do not violate the vague text of the Singapore summit joint statement, they shatter its spirit. Perhaps more importantly, they call into question the underlying assumption of Trump’s engagement with Kim Jong Un in the first place — that North Korea wants to exchange its nuclear and missile programs for a more prosperous future for its people. Will we make the same mistakes with North Korea as we did with Iran? Some in the Trump administration privately have expressed bewilderment to me and others that Kim Jong Un is not seizing the current window of opportunity to make a deal with the United States. After all, the thinking goes, no other president has been or likely will be as unconventional and risk-tolerant as Trump on the matter. What other president, for example, would agree on the spot to cancel U.S.-South Korea “war games” or express a willingness to withdraw U.S. forces from the Korean Peninsula, as Trump did in Singapore? What other president would invest so much political capital in building a relationship with Kim Jong Un? And what other president would offer a brutal dictator such a “bright future” in exchange for denuclearization? Such thinking makes sense if Kim’s goal is to leverage his nuclear and missile programs for economic assistance to improve North Koreans’ quality of life. But if, instead, Kim’s priority is to carry forward the nuclear program that his grandfather and father bequeathed to him, the program that North Koreans refer to as their “treasured sword,” then the Trump administration’s efforts to bargain disarmament for economic development will fail. The risk now is that Trump has staked so much on his personal diplomacy with Kim — and already declared the nuclear problem solved — that he will be reluctant to reverse course. Such concerns were reinforced by Trump’s August 2 tweet indicating that he looks forward to seeing Kim Jong Un again soon. If Trump meets Kim again without first securing tangible progress on denuclearization, then he effectively will be recognizing North Korea as a nuclear state. Doing so would give Kim Jong Un what he wants without delivering what the United States and the region need. Trump could argue that his personal relationship with Kim has rendered North Korea non-hostile to the United States and, therefore, North Korea can be trusted to maintain a nuclear arsenal. Similar arguments were made in the past to justify acceptance of Pakistan’s nuclear program. Such an outcome, after decades of determined effort to prevent it, would have huge consequences. It would leave the United States vulnerable to North Korean strikes. It would force Japan to question the reliability of U.S. security commitments and move to greatly strengthen its independent capabilities. Other allies around the world likely would follow suit. Acceptance of North Korea’s nuclear status would also encourage aspiring nuclear powers everywhere. It would embolden adversaries to pursue brinkmanship with the United States to determine the outer bounds of America’s pliancy to pressure. In other words, exposing the United States as a paper tiger on the issue Trump identified as America’s foremost security threat would create problems for the United States that extend far beyond the Korean Peninsula. Rather than boasting of his wonderful relationship with Kim and declaring the problem solved, now is the time for Trump to refocus efforts on the specific steps North Korea urgently must take to show its seriousness to denuclearize, and the incentives the United States and others would be prepared to provide in return. If North Korea proves non-responsive, the Trump administration must be prepared to freeze the negotiation process and revert to pre-Singapore efforts to intensify pressure on the Kim regime — even though doing so is unlikely to yield the same international unity as before. Now more than ever, Trump needs to test Kim’s intentions, not indulge his ambitions. Ryan Hass is a David M. Rubenstein Fellow in the foreign policy program at Brookings, where he holds a joint appointment to the John L. Thornton China Center and the Center for East Asia Policy Studies. Between 2013 and 2017, Hass served as the director for China, Taiwan and Mongolia at the National Security Council (NSC). Ryan Hass is a David M. Rubenstein Fellow in the foreign policy program at Brookings, where he holds a joint appointment to the John L. Thornton China Center and the Center for East Asia Policy Studies. Between 2013 and 2017 Hass served as the director for China, Taiwan and Mongolia at the National Security Council (NSC).